A schoolchild reads with the help of a solar-powered light. M-Kopa customers in Tanzania, Kenya and Uganda pay for their solar panel units in small increments using their mobile phones. Over time, they own the system, says Jesse Moore, the company’s Canadian CEO and co-founder. Many people dream of building their small business into an international power base, but two Canadian companies in Africa are taking different approaches to spreading the power. Jaza Energy and M-Kopa, both started by Canadians, are bringing small-scale solar energy to communities in Tanzania and, in M-Kopa’s case, to Kenya and Uganda as well. Their main line of business is similar, and it’s one that in the long term may be potentially disruptive for utilities in developed countries. Both firms deal in distributed generation – providing on-site, off-the-grid electricity that can be installed cheaply and quickly and which doesn’t necessarily require giant infrastructure such as power plants or transmission lines. Despite their similar market spaces, the two companies take different approaches to sales, marketing and distribution. M-Kopa customers pay for their solar panel units in small increments using their mobile phones, says Jesse Moore, the company’s CEO and co-founder. By using solar power to light homes, M-Kopa customers save the equivalent of 75-million hours of kerosene. The company has connected more than 700,000 homes in East Africa to solar power, with 500 homes added every day. “The ‘M’ in M-Kopa stands for mobile,” explains Mr. Moore, 40, speaking from the firm’s headquarters in Nairobi. “Our customers pay the equivalent of about 50 cents a day, making payment by phone. Over time, within a year or two, they are buying their solar system from us, in the same way as you would take a mortgage from a bank to buy your house,” he says. M-Kopa, started eight and a half years ago, has connected more than 700,000 homes in East Africa to solar power, with 500 homes added every day. The company says that by using solar power to light homes, its customers save the equivalent of 75-million hours of kerosene that would otherwise be burning, emitting fumes and contributing to climate change. Jaza, started in 2016, is smaller than M-Kopa, powering about 2,000 households, or about 10,500 people in Tanzania. It sets up and sells its power units through small-scale retail hubs, often run by women, which are both sales points and solar-powered recharging stations. Jaza Energy, a company from Atlantic Canada, is building solar hubs in Tanzania that charge batteries, which customers use to power their homes. Customers take their removable power batteries to the local hub each week to swap. A single hub can serve up to 100 households that need their batteries recharged. Unlike M-Kopa, Jaza doesn’t rely on mobile phones for payment, says Jeff Schnurr, Jaza Energy’s CEO and co-founder. “We see mobile payments as a way that captures the first wave of customers, and our method as the next wave,” explains Mr. Schnurr, 33, who operates out of both Dar es Salaam, Halifax and New Brunswick. “We see phone customers as early adopters and our customers as second-stage. A lot of our customers don’t have very big balances on their mobile phone accounts or don’t have phones. Also, people with mobile phone accounts still have to walk somewhere [usually a newsstand or local market] to load up their phones, and our power is about one-seventh of the cost of competitors,” he adds. Both methods appear to have a place, and different advantages, in East Africa. “We are problem solvers,” Mr. Schnurr says. Setting up hubs helps give communities a new focal point and – no pun intended – empowers women who can be in charge of the hubs. Swapping Jaza’s batteries costs householders the equivalent of 55 cents Canadian each week, so it is indeed cheaper than M-Kopa’s panels. 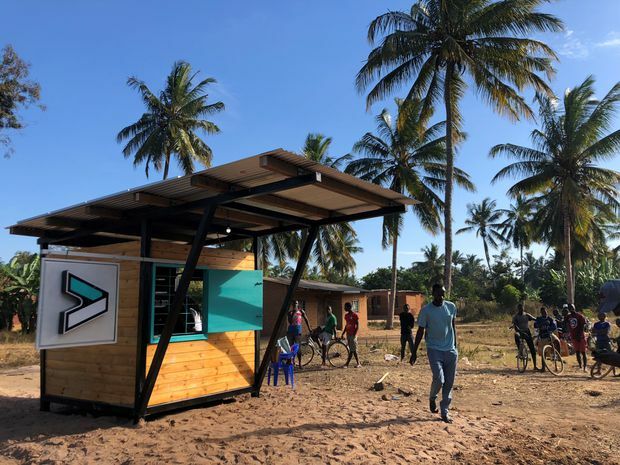 The retail hubs where the batteries are traded in and recharged using solar panels cost $6,200 to set up and can be put together in a few hours, making it possible to serve even the most remote villages. Jaza's small-scale retail hubs are often run by women.The company powers about 2,000 households, or some 10,500 people in Tanzania. Mobile payment, on the other hand, is a major method of financial transaction in Africa. According to the mobile sector’s umbrella group, the GSMA (Global System for Mobile Communications Association), more than half of the world’s nearly 300 mobile money services are in sub-Saharan Africa, used by one in 10 African adults. Many people in Kenya, Tanzania, Uganda and other sub-Saharan countries have bypassed traditional banks to use only their phones to save, invest, borrow, buy and sell goods and services and pay bills. It has been estimated that up to 40 per cent of Kenya’s GDP moves along the giant M-Pesa system, launched in 2007 in partnership with Vodaphone Group PLC’s co-owed Safaricom Ltd. In financial services, companies like M-Pesa can trigger a leap in technology that may suddenly leave existing infrastructure behind. This is happening to some extent in developing countries, where banks are moving quickly to migrate their day-to-day business transactions away from branches and offices to mobile phones and tablets. Some experts foresee a time when this could happen to electric power, too – with small-scale local units all over cities displacing massive coal and nuclear plants and miles of power lines. “Kenya’s power company cannot reach certain customers, so there is definitely a large market for off-grid solar power producers,” says Charles Field-Marsham, Canadian entrepreneur and founder of Kestrel Capital Management Corp., an investment bank specializing in sub-Saharan Africa. “But there will increasingly be competition,” Mr. Field-Marsham adds. The competition doesn’t bother either Mr. Moore or Mr. Schnurr, though. “There are several dozen companies in East Africa using pay-as-you-go models to provide solar energy,” Mr. Moore says. The potential to expand is huge, because the alternative – stringing power lines everywhere – is so expensive. “It can cost $1,500 to $2,000 just to string a line to someone’s home. That’s a crazy cost, before you even get any benefit,” Mr. Moore says. “We haven’t seen a lot of competition yet, but I don’t think it’s a winner-take-all market. There are 600 million people in sub-Saharan Africa without electricity,” Mr. Schnurr says. There are environmental benefits as well as economic ones, Mr. Schnurr adds. “Every household that is lit up by solar power is displacing kerosene fumes that would cause carbon emissions. And there are about 400,000 deaths in sub-Saharan Africa caused by kerosene fumes in homes, so there’s a huge health benefit to solar power as well. The Canadian CEOs of both Jaza Energy and M-Kopa agree: the potential for getting millions in Africa off the grid and on to distributed, small-scale power – often emission-free – is huge. Succeeding and growing in an emerging market can be challenging, though. “Development doesn’t happen without transformation,” says Graca Machel, chair of the Graca Machel Trust and widow of South African president Nelson Mandela. “We all have to move out of our comfort zones and move to a different level of thinking, operating, and engaging one another,” she said in the January issue of McKinsey Quarterly. For those who seek to build off-grid power, there’s lots of opportunity for new thinking. “Despite significant electrification gains since 2010, the potential market remains vast,” says the Lighting Global Group’s 2018 report on off-grid solar trends. The group’s research is supported by the World Bank. While 360-million people now have off-grid solar access, there are still some 1.2-billion people in the world without reliable power — about half in Africa. “Our company is exploring funding opportunities for off-grid solar companies in Kenya,” says Canadian entrepreneur and investment banker Mr. Field-Marsham, founder of Kestrel Capital Management Corp., specializing in sub-Saharan Africa. Take a long-term view of where you want your business to grow. Jaza, for example, is already planning to expand in the near-future from 40 energy hubs serving 2,000 households to 250 hubs powering 15,000 homes. There are different ways to reach markets and customers. Both the pay-as-you-go mobile method and the battery-swapping systems will work in different niches for off-grid solar power. A decade ago these ideas seemed far away. Both M-Kopa’s and Jaza’s systems are designed to be resilient by tapping into existing structures. One is connected to East Africa’s massive mobile payments infrastructure; the other expands community by community. While the two off-grid solar companies were conceived by Canadian entrepreneurs, they work on the ground in Africa and rely on their teams there.